contact YHA Web Manager Andy Pettigrew at -email- and he will send you registration instructions. If you experince problems with a team or teams that is persistent but perhaps cannot be dealt with using traditional umpiring methods, or stops short of being cardable, or if pre- and/or post-match hospitality towards umpires is not good let Anne Bryant know. Her role is not necessarily one where she will immediately contact the club concerned and berate them but one where she will evaluate the problem and if it persists from week to week and there is a clear indication that there is an ongoing problem with a team or club, she can take action. This may be through direct contact with a quiet word or could involve other YHA Officers up to and including the YHA Disciplinary Officer. Umpires are reminded that on-field issues can be sorted out by using the team captain, who is repsonsible for team discipline, and by using disciplinary cards. The Umpire Support Hotline does not replace usual umpiring methods of control during a game, but is there for use where these may be ineffective or before or after a game. This service is available to club umpires as well as neutral scheme umpires and is available to any umpire at any level. The Yorkshire Hockey Umpiring Association pre-season update and social event will take place at Wakefield HC on Wednesday 12 September. Pie and peas supper served at 7.00 and the main event begins at 7.30. We hope many of you will be able to come along to catch up with colleagues and get ready for the new season. We have been able to book space in the main clubhouse so easy access to the bar for coffee and beers! Feedback from last season's event suggested that we could make the event more relevant to club umpires and we've taken this into account in planning the agenda. We're delighted that national league umpire Lee Barron is coming along to lead a session reviewing video clips of in-game incidents - please remember that the rules of the game are the same whether it's a seventh team league match or the world cup final! Plenty of opportunity to share your thoughts and understand the key steps in getting to the right decision. We will also have a short session on the YHUA club support scheme and how we can increase the number of club umpire developers and support these key people. We'd very much like your input on this. There are no rule changes for the coming season but we hope to be able to update you on the ongoing England Hockey review of structures and how this might affect umpiring organisations. Please confirm your attendance with the -email- by the 5th of September so we can organise the catering. A 6-a-side Hockey Tournament is being organised at 3 venues on Sunday, 1st July, one in the North West, one in the North East, and one in Yorkshire (at Wakefield HC). It will not be open to the top-flight teams in the North. The winners from each venue will play in the Finals to be held at Wakefield. (Date unknown) YHUA have been asked to find out if any new, up & coming, and/or experienced umpires would like to umpire at Wakefield. Please contact Barrie Pollard (07762 618436) if you would like to umpire at this event. It is an opportunity, irrespective of your ability, to have a go. I’m sure help/advice will be on hand. YHUA would like to invite Club Umpirs Developers to attend the Yorkshire Cup Finals Day at Park Lane, Halifax, on SATURDAY 21st April. It will be an opportunity for Club Umpire Developers to gain some practical experience of coaching umpires, under the watchful eye of YHUA coaches. There will be a short session indoors, followed by Umpire Developers de-briefing and coaching umpires after they have umpired one of the Finals. The Yorkshire Hockey Umires Association would like to invite all umpires and YHUA members to a social evening on 11th January @ 7.30pm at Wakefield HC to discuss umpiring, hear from a North League coach and share any concerns or queries. It is free to come along and enjoy some light refreshments and good tips. Please confirm your attendance with the secretary, Alistair Copeland - -email- so we can cater accordingly. In my role as YHUA Coaching Co-ordinator/Chief Coach, I have written separate Protocols for Umpires, Coaches and Level 1 Assessors. 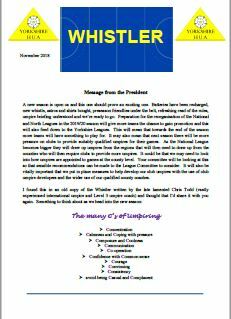 I believe these Protocols, plus the three present up-to-date EH documents regarding the L1 Assessment process, would be very useful for all YHA Clubs and their members. All the documents are already on the YHUA website, and will soon also be on the YHA website. It is important, however, that you have first-hand knowledge of this information because of the role you have in your Club. I'm sure you will be the first 'port of call' to answer any questions on the topics included in the 6 documents. If you have any questions on anything included in the documents, please feel free to contact me. My details are on the YHUA website and in the YHA Handbook. Hopefully, the information will be useful to everybody connected with hockey in Yorkshire, whether they are a player, manager, coach(player/umpire), assessor or umpire. FIH update the rulebook every two years so it’s worth checking you have the latest version. The 2017 edition of the rulebook, which comes into effect on January 1st 2017, is available below. The previous 2015 version and amendment from February 16th 2016 can be accessed here. The overall number of changes to the Rules for the 2017 Edition are relatively few and minor in nature. It was considered that there is currently no real need for any major changes, and that a period of Rules stability would be of benefit to our sport. minor points of clarification, a line appears in the margin of any text which has been changed. 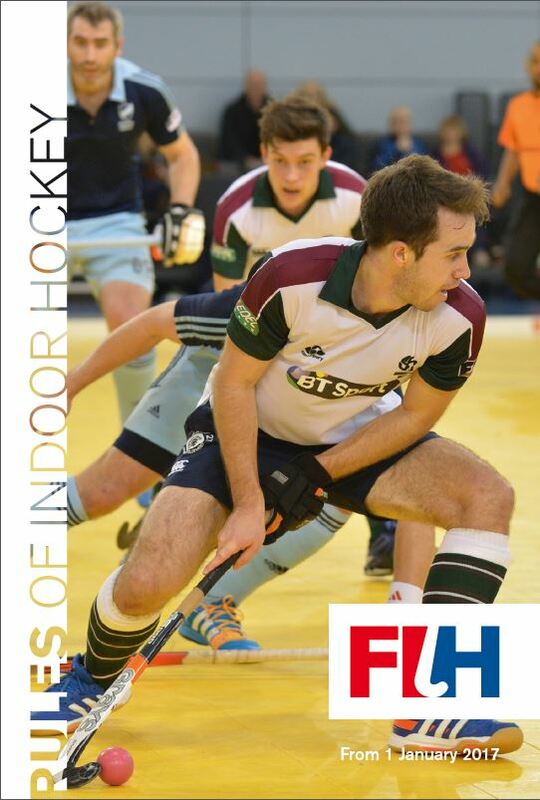 FIH have published the new Rules of Indoor Hockey. These will take effect internationally with effect from 1 January 2017, but National Associations have discretion to decide the date of implementation at national level. England Hockey have decided to introduce the new Rules across all indoor hockey in England with effect from 1 November 2016. There are a number of changes to the Indoor Rules. These are all marked with a vertical line in the margin of the Rule Book. They are summarised below, but players, coaches and umpires are encouraged to read the full text of the new rules rather than relying on this document. WE WANT TO HELP YOUR CLUB’S UMPIRES TO GET BETTER!! As mentioned at the YHA Clubs Meeting back in June, YHUA and YHA have come together to offer clubs help to develop their club umpires. YHUA will be running the EHB umpire developer course in September and October 2016. It’s a 3 hour course delivered by EHB tutors. We are offering 1 place to each YHA club to attend one of the courses. The best thing about it is……… it’s FREE!!!! We’d like every club in the county to have a club umpire developer. So, if your club has an individual who wants to become a club umpire developer, here is the perfect opportunity for them. The course will help equip them with some of the skills and knowledge they’ll need to help improve club umpires. Following representations from the regional hockey associations and umpires we have updated the red card and matchday misconduct offence regulations so that from the start of the 2016/17 season any player who receives a red card after committing a minor offence for a second time, having received a yellow card for the first offence, will no longer automatically receive a 16 day ban. This brings the rest of the sport into line with the EHL regulations. Full details of the announcement and the new regulations are detailed in the PDFs at the bottom of the page. We would also stress that offences involving the use or threat of violence or verbal abuse will continue to be treated seriously and will incur a minimum 16 day suspension. These new regulations will come into immediate effect. All the relevant forms and guidance around discipline can be found here. All members are invited to attend, it would be great to see more people there, and wanting to be involved. There are vacancies on the committee if anyone would like to apply please notify me directly. Some important notices have been on our website as news items, Click here if you have missed them. Level 1 Umpire Courses are no longer organised by YHUA but centrally by England Hockey. Guidance for both organisers and participants can be found here. If you would like to attend a course then they can also be found at Find A Course and you book your place online with England Hockey. You can choose to attend a course anywhere in the country at your convenience. Umpires wanted for Harrogate HC’s 45th Crawfurd Porter Veterans Tournament at Harrogate Hockey Club from Friday 8th- Sunday 10th May 2015. There will be various 50 minute games on Saturday 9th and Sunday 10th ,with separate men’s and ladies competitions. The hockey will take place over 2 venues with a Shuttle Bus available all day on Saturday. There will be live entertainment on the Friday night with the usual curry available at the Hockey Club and Saturday night’s sit down meal will be a posh a buffet supper. Music and dancing will follow at the Hockey Club. Any umpires willing to help are welcome and we be kept well watered and fed during Sat and Sunday. For more information. Minutes of last year's AGM and Agenda for our forthcoming AGM on 23rd April @ 7.30pm at Wakefield have been emailed to all members. It is vital to see members of the association attending this meeting and ensuring that the items they want to see happening, where we can support you - are put forward. The committee cannot plan training event and social events if members do not attend or make their ideas and feelings known. Linked to this is the need for new "blood" to join the committee - even if you would like to be involved as a way of "training" new members for the future. The association can only continue if members are willing to share their time, expertise and participate in the association's future. Please give this some thought ahead of the meeting, and consider what you may be able to offer. If you would like to stand please let me know by 15th April 2015. Our latest edition of the Whistler will be following this invitation to the AGM - so please have a read and note the date of the end of season Dinner. We look forward to seeing as many members as possible on the 23rd. Are you a budding Young Umpire? Do you want to develop your umpiring further? Are you a club with Young Umpires looking for development opportunities? This year's North Young Umpire Challenge takes place on Sunday 29th March at Leeds University, run by the North Young Umpire Action Group, in conjunction with North Hockey Association. We are looking for Young Umpires aged 13-21 to represent their club / county, umpiring the North In2Hockey Finals. All umpires will need to be on camp from 6pm on the Saturday evening to prepare for the following day where they umpire matches and receive coaching and support from qualified umpire coaches. You should ideally already hold a Level 1 Umpiring qualification but those working towards this will also be considered. All umpires will receive accommodation on the Saturday night, breakfast and lunch on the Sunday along with an umpiring shirt. There will also be awards for the "Most Promising" umpires and an opportunity for those selected to join the North Young Umpire Promising List. More information about the Promising List and the opportunities it offers can be found on the North RYUAG section of the North Website. This is an ideal opportunity for any umpire wishing to develop further and is where many of the top North Young Umpires started their umpiring careers and have gone on to umpire at both Regional and National level. Click here to go to the England Hockey online training module “Decision Communication”. The module is designed for new or inexperienced umpires and will help them understand how to communicate decisions effectively. The module contains five sections. Your learning in each section will be helped by a series of video clips that will illustrate key points. At the end of the module, you will be asked a series of questions, and when you have answered them successfully, you will be able to download your certificate of awareness. Completion of this module should take about 30 minutes. The Rules of Hockey apply to all levels of the game and these changes will take effect at International level from 1st January 2015. We have also decided that, beneath the IWHL and NPMHL, the changes will not be implemented mid season (i.e. from 1st January 2015). 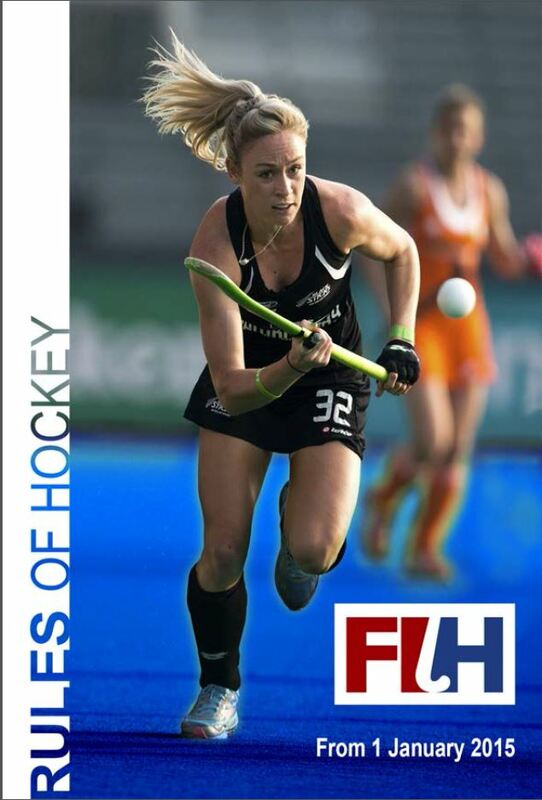 During the early part of 2015, we will be consulting more widely with the hockey community as to whether we apply to FIH to opt out of the introduction of any of the new Rules and, if so, at what levels and/or age groups. A decision will be made on adoption of the new Rules after this consultation. We will allow the use of the new face masks at all levels of the game with immediate effect. The FIH are introducing them for safety reasons and we continue to recommend that players use the appropriate safety equipment i.e. facemasks at penalty corners, mouth guards and shin pads. There is NO Technical Red Card outside National League. An umpire can issue more than one yellow card if it’s for a different offence. 1) Use Signal & voice to let everyone know what each Yellow Card is for. 2) There is a minimum time for yellow card & not a maximum. If an umpire issues a Red card they must fill in a Red Card Report Form & they can’t rescind the card. After the final whistle you can’t issue a Red card it is an MMO (Match-day Misconduct Offence). Remember you must inform the person that you are issuing the MMO. 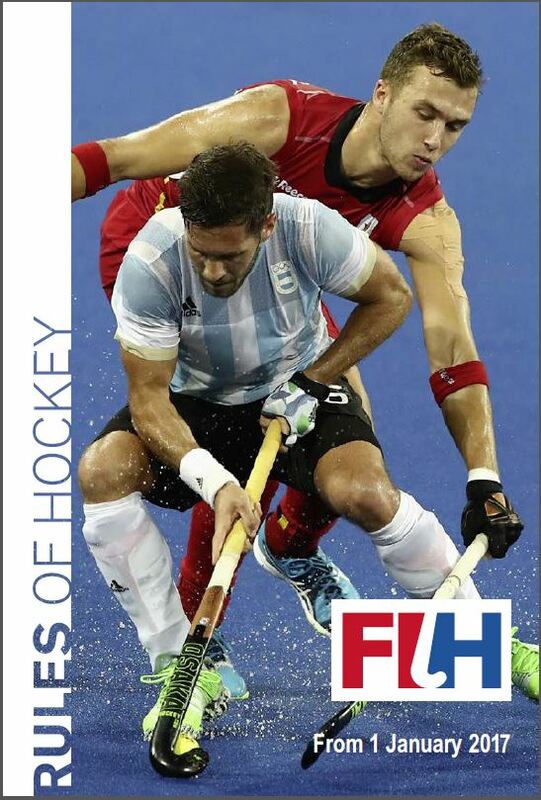 FIH has today published the latest Rules of Hockey agreed at the Executive Board meeting at the FIH Congress on 30th October 2014. They are available for worldwide adoption and effective at international level from 1st January 2015. ENGLAND HOCKEY will decide when these changes will come into use in England and will issue guidance in due course. Yorkshire Hockey Umpires Association are pleased to announce that there will be an Umpire Developer Course at Wakefield Hockey Club on Wednesday 18th February 2015 at 6:30 to 9:30 pm. This is aimed mainly at Club level and it is hoped that each club will eventually have their own Umpire Developer. This will help improve the standard of umpiring throughout the Yorkshire League.